the art of mindful eating : The Seven Pillars of Mindfulness by Jon Kabat-Zinn. The Seven Pillars of Mindfulness by Jon Kabat-Zinn. To gain awareness without trying to change anything. To be skeptical but open – to see what happens. You need to consciously, intentionally and purposefully cultivate the attitudes of 7 Pillars of Mindfulness. They are not independent of each other. This Foundation of attitudes and commitment will guide you towards change. Mindfulness is developed by being an impartial witness to our own experience impartially. This requires standing back and observing our own thoughts. A great way to practice this is observing your own breathing. Patience is considered to be a form of wisdom. It demonstrates that we understand and accept that sometimes things must unfold in their own way and in their own time. Take for example the Butterfly chrysalis if someone were to interrupt the process of the butterfly emerging from the chrysalis, even with the best intentions, the butterfly would never have the strength to fly. Often what we 'already know' can get in the way of seeing things as they really are. Try attempting to experience everything as a new experience even if it is the old same activity. Even routine activities are a new experience because every moment is a brand new moment. This prevents us from getting stuck in the rut of our own expertise. Try this experiment with a spouse or partner, a co-worker, or even on the drive home from work. Cultivating trust in your own inner wisdom is an essential part of mindfulness practice. Learning to honor your feelings and intuition when something does not feel right is a fundamental aspect of cultivating inner wisdom. When practicing mindfulness you are taking responsibility for yourself and learning to listen and trust your own being. The more you trust yourself the easier it will be to trust others. This is particularly useful in the practice of yoga, or any other form of exercise you do. You need to pay attention to your body, back off or stop particular stretches. There is purpose in almost everything we do. Either striving to get something or somewhere. In meditation this attitude is actually an obstacle. It involves practice and energy in non-doing, there is no other goal other than for you to be yourself where ever you are at. This paradoxical thinking may sound crazy, especially because most people embarked on the mindfulness journey to reduce pain and/or stress. However if you were to actually sit down and say, 'Now I am going to now reduce my stress and pain, or both by doing this meditation', you have introduced the idea into your mind of where you should be as apposed to just being where you are. Acceptance means seeing things as they truly are in the present moment. Quite often times we deny or resist what is - especially if we don't like it. Unfortunately, by not accepting we are spending much of our energy trying to force something to be different. This can create more tension and prevent positive things from occurring. Acceptance does not mean you have to take a passive attitude towards everything and abandon your principals and values. It simply means you are no longer resisting. Often our minds get can get caught up on a certain thought or idea, despite our knowledge of that no good can come of these particular thoughts, we continue to focus on them. Alternatively there can be certain thoughts or emotions that we try to avoid. In Mindfulness we try to just experience things as they are. Letting go is a way of letting things be as they are. Consider what outcomes you are attached too, and see if you can practice non-attachment. Try letting the experience be what it is and just experience it moment by moment. A good example of letting go is falling asleep. We have to let go of our thoughts and our tension in our body in order to go to sleep. 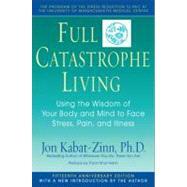 Full Catastrophe Living: Using the Wisdom of Your Body and Mind to Face Stress, Pain, and Illness by Dr. Jon Kabat-Zinn is the book you MUST have. It has become my reference book. Every time I read it I open more and more aspects of wonderful practice every woman have to learn and practice – mindfulness. By using the practices described in the book, you can learn to manage chronic pain resulting from illness and/or stress related disorders...discover the roles that anger and tension play in heart disease... reduce anxiety and feelings of panic; improve overall quality of life and relationships through mindfulness meditation and mindful yoga.